The DNA cold press juicer produces pure, clean juice by squeezing produce through a dual-stage juicing process, and has an extra wide feeding chute to fit large pieces of fruits and vegetables. This product comes with a 10 year warranty on the motor of the machine. Includes free strainers for juicing, sorbets and smoothies worth R500. While stocks last. View more from Slow Juicers, DNA. The first thing that you will notice, it's quiet, second the pulp that comes out is nearly dry, all juice extracted. Easy to clean. Pomegranate pips, blueberries a little sparkling water is a favourite of mine. I did extensive research on which auger juicer to buy. Then I received a discount voucher and decided it worth the plunge for this one. Watched all the demo videos too! Received my juicer in record time and immediately got some veggies to juice. Quiet operation, pulp is super dry and cleaning was a breeze! The juice tasted amazing. Unlike other reviewers, mine came with a handy booklet with recipes to start with. I didn't struggle too much with putting it together. The pulp extracted gets a bit much so keep an extra container handy! I also didn't have to cut into small pieces... just small enough to fit into the chute works fine. Will update review in a month to see how it's going! Ok, so two months later... still loving this juicer. We don't buy juice any longer and I only need to juice once every 3 days to keep the family supplied. Takes about 40 mins including prep and cleaning to make 4 litres of various juices. Favourites are super green, beetroot and orange. Can't wait for summer fruits to come into season. I do use the fine strainer for half the orange juice, else it has too much pulp. No problems. There's a little red plastic 'plug' in the main part that keeps popping out. When this happens pulp is not as dry as it should be. Happens seldom but especially if I juice for more than an hour. I deliberated between the DNA and Oscar cold-press juicers for quite a while, but am really glad I went with this one. Price point: Unbeatable for a juicer in this category. Looks: High quality silver finish; no scratches and looks hard to scuff. Sounds: Very quiet. I was surprised at how little noise the unit makes for such a powerful motor. I am very satisfied with this product. I might have expected a little bit too much, and therefore I am a little bit disappointed in the ability to handle a large load of fruits and vegetables, especially harder veggies like carrots and beetroot. However, I have realised that cutting the veggies into smaller pieces definitely improves the ability of the juicer to produce a large amount of juice from veggies. Another reviewer mentioned the frustrating lack of instructions. I can attest to this. Although the juicer is very simple to assemble once you figure it out, without me having watched a number of videos on how this thing works, I might not have assembled it as fast as I did, without the instructions. Perhaps watch a couple of videos about this and other juicers of the type, to see how the pieces fit together. 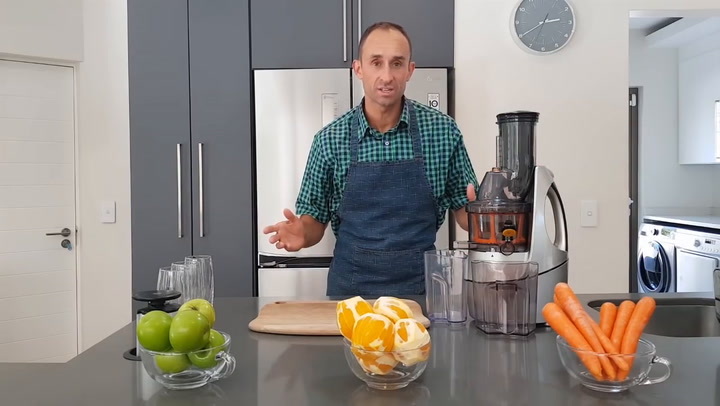 Finally, this juicer does not do as well with softer fruits like oranges and pineapples. It seems that it leaves quite a bit of juice behind in the pulp, compared to other fruits and veggies. Also, sometimes you will find an entire piece of apple stuck inside when you clean it. While the above review seems negative, I am actually quite satisfied. The above are all the little problems that I experience, and the overall experience is very good, in general. The product performs well, and is significantly cheaper than anything else I could find in this class (R4k for the Huron). I would definitely recommend this for someone who is new to juicing, or who doesn't have the funds to purchase the more expensive juicers. This juicer is a thousand times better than the centrifugal juicers, though, so don't get one of those. You'll be buying one of these pretty soon after. 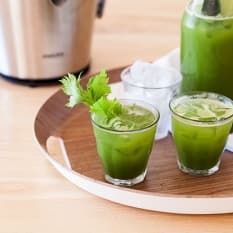 I'm obsessed with my slow juicer - I juice daily! This is so quick and easy, juice extraction is highly effective! Also almond milk is so simple with this and the pulp it leaves make amazing biscuits! If you're interested in health and consuming more from the earth than from a box I'd recommend this!!!! Masticating vs centrifugal: what's up with all this juice jargon?